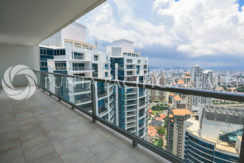 The renowned Trump Ocean Club Panama (currently known as JW Marriott Residence) is one of Panama’s most luxurious condominium towers in the country. Located in the exclusive residential enclave of Punta Pacifica, Trump Ocean Club provides five-star luxury living, unlike any other in Panama. The residence tower was designed with opulence and a concept of providing “white glove” hotel amenities, such as the 24-hour concierge, security, valet and room service. The 71-story tower is not only the tallest building in Latin America but with 2.9 million square feet, it is also the largest building south of the United States border. The residence provides unrivaled amenities such as an infinity pool deck with breathtaking views of the Pacific Ocean, complimentary towels and sunscreen, a signature bar and grill restaurant. After a day in the sun, head down to the ocean deck for a cool drink and enjoy the breeze at one of the four oceanfront restaurants. A luxury-living concept that provides: fine restaurants, a world-class gym and spa (spa and casino are under development) with trainers; yoga studio, pilates equipment, business center, beauty salon, convenience store, travel agency, art gallery, cafes, boutique clothing stores and more. The Trump Ocean Club International Hotel and Tower truly has it all! 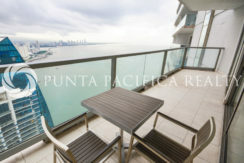 In addition to Trump Ocean Club, Punta Pacifica has all the advantages of excellent private schools, access to the Ocean Reef international marina (under development), Multiplaza mall, Johns Hopkins state-of-the-art hospital as well as a 24-hour grocery store, and close proximity to the city’s banking center. You can walk, drive, or just hop on the complementary Trump shuttle and arrive at any of these destinations in minutes. 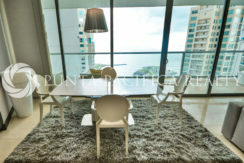 If you appreciate the finer things in life and are planning on having a primary residence or second home in Panama, we have your key for Trump Ocean Club.